Miranda Lambert is well-known for her fascinating storytelling prowess, but ever wonder what was the specific catalyst for some of her more confessional songs? Turns out these stories can be just as interesting as the music itself! In this exclusive clip, the group of songwriters behind Lambert’s tune “Priscilla” explain the inspirations that drove them to pen the song. The narrative of “Priscilla” is taken from the story of Elvis and Priscilla Presley, who lived a relentlessly public partnership from day one of their marriage. lThe parallels to Lambert’s life are obvious: She’s married to a man “who’s married to attention” — namely, her wildly successful husband Blake Shelton. In the song, Lambert asks Mrs. Presley for advice as she figures out how to navigate her role in her current “king and queen of country” scenario. Lambert herself personally weighs in on the songwriting discussion, noting that she ran the song by Shelton, who noted “Are you sure you want to go there?” Lambert’s answer: Hell yeah! “Priscilla” is featured on Lambert’s most recent release, Platinum, which came out in June. The set won Album of the Year at the 2014 Country Music Association Awards, and is currently up for Best Country Album at the 2015 Grammy Awards. 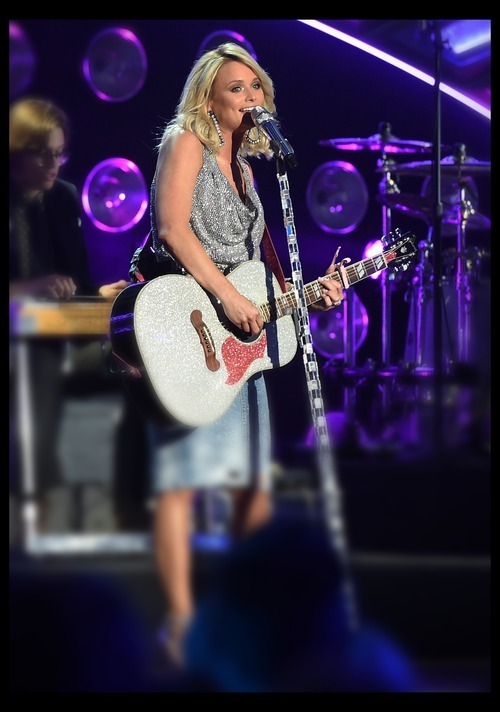 Lambert is currently on her Platinum tour; you can check 2015 dates here. When not busy with her music, she’s updating her brand-new Pinterest board: Check that out here.